In 1987 Bill and I made a trip to the U.S.S.R. Glasnost had been adopted (a Russian word for "openness") and communism was on the way out, but its effects were still evident. The shroud of socialism over the Soviet people was paralyzing and depressing. We saw workers at "construction sites" in Moscow just sitting, smoking, passing time. If the state assigns you a job, and you won't be promoted nor paid more for working harder or better, why work at all? Food in even the most upscale restaurants was mediocre. Our hotel room was like a low-rent room from the 1950's, including a broken radio in the bedside table. Merchandise in dimly-lit department stores was dated and meager. Everything just seemed dirty. Saddest of all were the people. No smiles, no joy. They looked spirit-less at best and lifeless at worst. I came home thankful that we can choose where to live and work. We take for granted the ability and freedom to improve our lives in this country. For the first time in my life, I realized first-hand the benefits of living in a nation that embraces free enterprise and democracy. We've heard it before: freedom isn't free. But it's true. I thank all those who have bought our freedoms with their very lives. In the midst of our grilled burgers and baked beans, I hope we all pause to remember. He's after me: the hungry Verizon salesman. A guy named David calls me about once a week and since I now recognize his number, I don't answer. But when I finally do, I have some things to say to young David. 1. I don't like, want nor need a smart phone. They are too smart for me. 2. I won't spend money on a new phone and you can't coerce me to do so. 3. I remember learning in a college advertising class that there are different methods of getting people to buy. One is called "bandwagon." I won't be lured onto your phone bandwagon. 4. While I am amazed by the apps on my daughter's iPhone, I resist the urge to want one. 5. Now that I've learned to text without an actual keyboard, it works for me. Why, I've learned a new language! 5. And anyway, what's wrong with the phone I've had for almost two years? I don't ever remember getting a new phone growing up. Our phones lasted 25 years! 6. And David, you need to get inside a middle-aged person's head. I'm trying to simplify, not complicate my life. Just leave me alone with my dumb phone. Which do you prefer: smart phone, dumb phone, or neither? And Ari looks smashing in smocking. How does a SAVED blog post disappear? I wrote one last night, planning to finish it up this morning. Only to find it - gone! No time to re-write it, so I'll post this photo by my daughter-in-love Jenny. Great photography skills, Jenny! My sweetie Ari and her dad, Dan, are having fun in the sprinkler. I can't wait to see and play with her ... soon! The dog is jumping on the bandwagon of clearing clutter around here. Ellie has taken to nibbling, tearing, and shredding old papers, clippings and photographs. The older, the better. And why do we have paper piles within a dog's reach? Because we are ... hopelessly cluttered. So her newest pile, in the basement (one of us forgot to shut the door) was entirely Bill's. Hoo boy, it was a bonanza: years of birthday and Father's Day cards, kids' artwork and notes, and newspaper clippings from - no kidding - the 1960s! - found out what it's like to be dragged downstairs by 6:30 a.m.
- washed sand out of hair four times. - played in the sandbox four times. - stayed up til past midnight. - made 2 trips to the park. - ate McDonalds with the boys. - made a yummy chicken salad for dinner on the porch. - washed off several scrapes: knees and arms. - scorched a double batch of granola. - made a big potato salad for the church supper. - had a discussion on death with David. - saw the first lilacs. - made reservations at a B & B in Marblehead - two nights! This note reveals the fullness of my days and hands, the intensity of mothering toddlers, and the treasured relief of extra sleep. I remember being that woman of 25 years ago, but it's a distant memory. Much as I like to de-clutter around here, letters - nearly all letters - are preserved. Each is a piece of a person and a snapshot of a moment in the writer's life. A letter reveals personality, humor and mood. A letter is heart. And certainly, a letter is love poured out. 1. Being named Barbara, I never allowed anyone to call me Barbie. It sounded too girly. yech. 2. Barbie wasn't a doll, she was a mini-woman. A woman's figure. Woman's clothing. Woman's hairdo. And a boyfriend. yech. 3. She was so not cuddly. Dolls should be cuddly. I was aware that my aversion to Barbie ostracized me during playdates. I'd watch my friends dress their Barbies, brush their hair and go out on dates with Ken. But all of it repulsed me! And when a Barbie would turn up naked, as they always do, I found it embarrassing for all concerned. Truthfully, I wasn't hugely into dolls. I did have a Betsy McCall doll (anyone?) but my interests leaned to biking, building forts, bugging my brothers, cooking Creepy Crawlers (anyone? ), reading books, and - ok I admit it - TV, which was superbly educational in the 1960's. 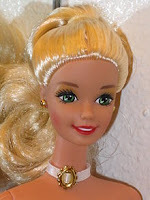 When I had my daughter Katie, I decided to influence her choice let her make up her own mind on Barbie. I never bought her a Barbie and hoped she wouldn't ask for one. Thankfully, American Girl dolls came to the rescue just in time. Beginning with Bitty Baby and moving on to Samantha, these were dolls I could embrace. Sweet dolls who looked like girls, didn't have boyfriends or breasts, and even taught a bit of American history! If you played with Barbies, that's ok. You can still be my friend. Just don't expect me to buy Barbies for my granddaughters! So the old joke goes: first prize is a week in Cleveland and second prize is two weeks in Cleveland. OK, so it's not Seattle or San Diego. But look for beauty and you will find it. And that I did for two days this week as we caught up with our son David. Coming up on its 100th anniversary, the West Side Market has been a market from the start, never anything else, according to one of the vendors. You'll find meats, cheeses, fresh produce, coffee, pastries and lots more. Fabulous sights and smells. This crepe-making lady kept busy ... it was fascinating to watch her at work! I think I might like this; maybe I should taste it with my granddaughters! with someone's mother's day greeting. 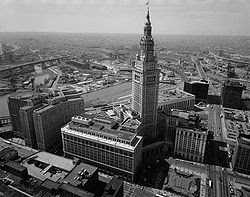 Here's a peek inside the spectacular Terminal Tower, which stood as the tallest building in North America outside of New York City from its completion in 1930 until 1964. (thank you, Wikipedia) YES - second tallest building in the world until 1964 - crazy! And finally, the Indians-Tampa Bay Rays game on Tuesday evening. I appreciated that these gentlemen behaved like, well, gentlemen. The row behind us made too many trips to the beer concession stand. I do like a good baseball game. As sports go, it's generally refreshingly civilized. And David, you haven't seen the last of me in Take Two! It seems that Blogger, which is how I post, was down for about a day. If you commented on my last post (and at one point I saw 3 comments), they have disappeared. So I'd appreciate if you'd re-comment! Thanks. Insane week .... will try to get a new post up soon! "Feeling so full of love and gratefulness after a sweet two days." ~ quote borrowed from Donna Boucher - a photographer/blogger I follow. smarter and cooler than me. ﻿No yelling at mom: not allowed. paying bills, buying a car, feeding themselves and doing taxes. Then mom and dad are suddenly smarter! We spent the last two days with David, our oldest. When he's working, I'm still not allowed to hug him or ask him to pose for a photo. Awkward. But otherwise, he seemed totally comfortable hanging out, eating, laughing, talking, and walking down the street with me. It was a full and sweet time and I am grateful. Grateful he loves his career. Grateful that a grown son seemed to enjoy being with us. Grateful I no longer have any 14-year-olds! Grateful for a full heart. this weekend always delivered a mixed bag of emotions. 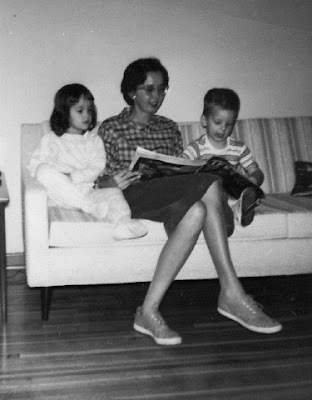 My mother died on May 7, 1979. I wish like anything it hadn't been Mother's day week. the displays of Mother's Day cards. I told myself to get a grip, to accept what is. 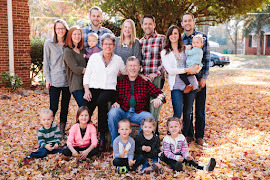 in the loss of my mother. I also learned to be a strong and resourceful mother on my own. I learned to appreciate my children and focus on them more than my loss. that I needed God more than a mother. I am learning to be an encouragement to younger women. Mom was selfless and humorous, enormously generous with her love. and get busy loving others. Mothers shape their children, but also the parents they might become. It's a two-for-one deal and it's powerful to ponder. and seek to share them with others. is the best way to honor them. I know, I know. Our kids keep reminding me. The holes on the wall of our stairwell are utterly ridiculous. They clearly reflect that champion procrastinators live in this house. I blame them on the builder, who neglected to build an access to the tub plumbing. When a plumber had to cut into the wall to repair the plumbing about two years ago, trouble resulted. For about a year, I covered it with - I am not making this up - a piece of Christmas wrapping paper in a poster frame. Well, that was acceptable for December and part of January, but by July it was just stupidly pathetic. So the houseguests/relatives who were here last September are coming again in two weeks and I absolutely must find an acceptable alternative to disguise the holes. Look out. I have an idea and it doesn't involve wrapping paper. But I'm also taking suggestions. Please hurry! but found them a bit stuffy. and of course the hearty hostas, returning hale and healthy! A warm welcome to you, spring. Raking leaves, weeding, planting flowers, washing windows, stuff like that. others fanned out to the homes of the elderly. went to Betty's home Saturday morning. Betty can't see well, so she appreciated our work around her yard. But she also talked with us, laughed with us, and gave us gentle direction. that it makes your day, as it did mine.